Big Buddha Seeds Blue Cheese. Big Buddha Seeds Blue Cheese Review. The Big Buddha Seeds Blue Cheese is one of the most sought after of all U.K Cannabis strains. Containing an explosive infusion between Big Buddha Seeds Cheese and an undisclosed Blueberry male, the Big Buddha created one of the most distinguishable tastes of Marijuana currently available. Correct at posting, there are only two Coffee Shops in Amsterdam that sell Original Blue Cheese; Green House Seeds Company and Barney’s Farm,read a complete review of the Big Buddha Seeds Blue Cheese and our recommendations for your next trip to Amsterdam, Marijuana Capital of the world. 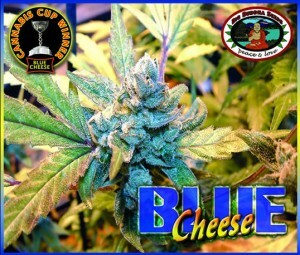 How Do You Describe Big Buddha Seeds Blue Cheese ? How do you define a taste, a smell, the sensory perspective that’s activated by the Big Buddha Seeds Blue Cheese, it’s hard. I am probably biased, i love Big Buddha Big Blue Cheese, but even i struggle to put into words the taste of this award winning hybrid, If you’re planning a trip to Amsterdam, be sure to buy Big Buddha Seeds Blue Cheese, you won’t be disappointed. Big Buddha Blue Cheese seeds produce a stable, Indica dominated hybrid containing the very best characteristics of the Blueberry male and original Big Buddha Cheese. The combination of 80% Indica and 20% Sativa combined into a stable seed, and with high germination rates, produces squat, bushy plants that mature fast, yield well and emit a fruity Blueberry aroma. It is recommended that you allow your Big Buddha Seeds Blue Cheese plants space while in its vegative or growing stages, they grow uniformly, producing fairly short, strong plants which become very bushy as they develop. Close internodes (branches) make this an ideal choice for indoor ‘Sea-Of-Green’ gardeners. Veagative growth benefits from bending and pruning techniques, which enhance the side branching development, increasing yield at harvesting. Flowering time for the Big Buddha Seeds Blue Cheese takes between 8-10 weeks indoors, and comprises of a large main cola and respectable side branching, especially if you follow the super-cropping techniques that can be applied during growth and pre-flower. Outdoors, Big Buddha Seeds Blue Cheese will mature in the early part of November, ideal for a Blue Cheese Halloween party. Although not considered a heavy hitting cash-crop, the quality is superb, as maturity approaches, a purple hue, or glaze can be seen around the buds, especially outdoors or in grow-rooms that suffer extreme changes in temperature, such as lofts and out-buildings that cool down considerably during the night and early hours of the morning. ← Why Choose Big Buddha Seeds.